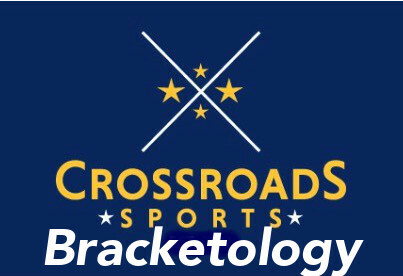 Alright sports fans, here is the latest Crossroads Sports Bracketology update for January 28th. The big result in West Lafayette on Sunday has a lasting impact on today’s updated bracket. The Spartans have fallen from the 1 line, replaced by in-state rival Michigan who was only on the 2 line for a very brief period of time. Additionally, Purdue now climbs all the way up to a 4 seed. Many might think this is overrating a 6-loss team, but I contend that the Boilermakers have played one of, if not THE toughest schedules in the country. Not all schedules are constructed the same way. 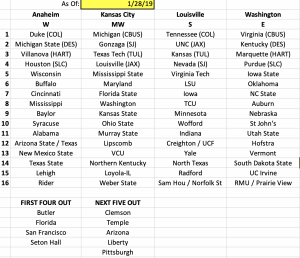 Sometimes a deeper dive is needed to analyze these teams and where they fit on a national scale. Show me a team seeded 5 or worse that has a more impressive resume than the Boilers. You can’t. While the latest Boiler victory is the crown jewel, their resume also boasts wins over Wisconsin (in Madison), Maryland, Ohio State (in Columbus), Iowa, Indiana, and Davidson. Expect some more notches on this impressive resume as we move through February and into March. Virginia Tech – best wins: Purdue (neutral), Washington (neutral), Syracuse (home), combined with a bad loss to Penn State (road). This is the most overvalued team in the country. 4 of their 5 conference wins are against Notre Dame, BC, Georgia Tech, and Wake Forest – all ACC bottom dwellers. The Hokies still have a lot to prove. LSU – best wins: Mississippi (road), Arkansas (road), St. Mary’s (neutral), combined with a bad loss to Oklahoma State (neutral). They’ve won a lot of games, but the schedule is just not that impressive. If the Tigers have played Purdue’s schedule, guarantee they’d have at least 7 or 8 losses. Again, not all schedules are constructed the same. Do any bubble teams actually want to make the field of 68?? Every week, the teams that are seeded in the 9-12 area (bubbly resumes) seem to be losing, and then losing some more. Year after year, the bubble is always referred to as weak, but I’m not sure I’ve seen a year where these teams continue to make their case for a spot in the NIT. It’s as though they don’t even want to make the tourney (see Clemson in their epic collapse against NC State, or Indiana’s entire month of January). Some of these teams are going to back into the dance and really shouldn’t. Hopefully, this bodes well for some of the smaller schools on Selection Sunday, but I’m not holding my breath. 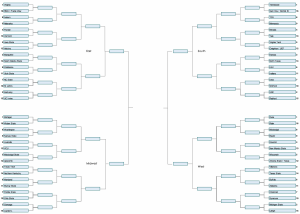 With that said, please enjoy today’s rendition of Crossroads Sports Tourney Predictor.